Nambiar’s role in the freedom struggle, as Bose’s second-in-command in Berlin and the constant support he offered to the Gandhi family render him an important part of Indian history. And in this, Balachandran’s contribution is significant. The Secret Life of ACN Nambiar. Despite the inglorious accounts that dogged him throughout his life and even after death, Nambiar’s role in the freedom struggle, as Bose’s second-in-command in Berlin and the constant support he offered to the Gandhi family render him an important part of Indian history. And in this, Balachandran’s contribution is significant. In Balachandran’s eyes, Nambiar is a solitary, almost diffident man, with an apparent aversion for the public glare of active politics. He moved to England in 1919 with his then wife, Suhasini Chattopadhyay, the youngest sister of Sarojini Naidu. Berlin had emerged, shortly after World War 1 and before the rise of Hitler, as a hotbed of politics and culture; the couple, acting on the advice of Naidu’s son, decided to move there. Nambiar first met Nehru at an anti-colonial conference in Brussels, in 1926. He then received an ailing Kamala Nehru in Vienna, which marked his first meeting with the 17-year-old Indira. He was also put in charge of a representative office in Berlin to help Indian students, at Nehru’s behest . And thus he shied away from politics even in the midst of leftist revolutionaries like Virendranath ‘Chatto’ Chattopadhyay and M.N. Roy, founder of the Communist Party in India. His wife, Suhasini, eventually parted ways with him, went to Moscow and returned to India, where she became the first woman member of the Communist Party. The rise of Hitler brought about a marked change in progressive Berlin. In 1933, the Reichstag fire set off a clampdown against communism in Germany. “Some 4000 communists, including Naidu and Nambiar, were imprisoned,” said Balachandran. After his imprisonment, he moved to Prague, where he met the Netaji. “Bose visited Prague, where he sent for Nambiar. The latter had established himself as a prominent journalist,” said Balachandran, who, during the course of his research, managed to find all Nambiar’s dispatches from 1926 to 1934. When Czechoslovakia was invaded, he travelled to South of France and hid in Foix, a small village on the Spain border. “Nambiar was on the run and had lost track of both Nehru and Bose until a journalist tracked him down,” Balachandran explained. 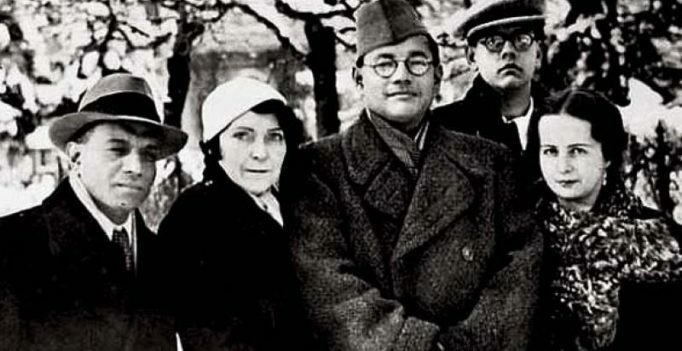 “He thought he was in trouble, but the man turned out to be a messenger from Bose.” Subhash Chandra Bose needed someone to run his operations in Germany when he left for Japan in the 1940s. “Bose hoped Nambiar might take over his operations in Germany.” he said. “The Indian legion ultimately rose to about 4000 people but they had to retreat after the tide turned in favour of the Allies.” Nambiar was banished to a concentration camp, where he remained for six months. “After that, Nehru wanted him to join his government, which he flatly refused to do. He was an impoverished man in Europe but he wanted to stay there. Even so, he stayed with Nehru every time he came to Delhi,” said Balachandran, whose book contains the letters they exchanged.